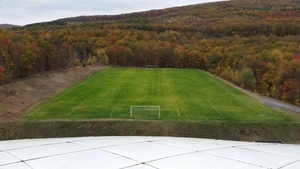 The Wyoming Valley Sports Dome (WVSD) is a state-of-the-art indoor/outdoor sports facility located in the beautiful mountains of Northeastern Pennsylvania. WVSD is easily accessible from all directions with great highway access from New York, New Jersey and Western/Southern Pennsylvania. WVSD is a uniquely crafted, temperature controlled air structure offering 76,000 sq. ft. spread amongst 3 separate fields, thus providing plenty of space for teams and spectators to experience the open air feel. The Fieldturf playing surface is made of non-abrasive turf which simulates real grass and gives true roll and bounce to all sporting balls. WVSD also opened its 1st outdoor field in March of 2016 and has started the permitting for it 2nd field. Please use the menu above to learn more about the sports and activities offered at the Dome. Adobe Reader is required to view many documents throughout the site. You can download it for free by clicking below.